Awesome! Congratulations, Nancy! I will be sure to check it out. Margie's site is such a wealth of information and what an honor to be included. Well deserved! What a masterpiece!!!! Very Very cool my friend! Oh, how awesome!! I'm rather fond of that piece of jewelry. Congratulations!!!! What an honor. Its a beautiful piece, as I think ALL of your work is. That's fabulous news -- congratulations! Thank you so much, everyone! I am so honored to have such lovely friends, and I appreciate your support so much!!! Congratulations!!!! I'm glad to hear such fantastic news from you!!!!! 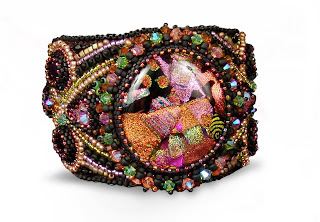 Congratulations, this cuff is fabulous. Love the colors! Felicidades, sus trabajos son de Ensueño,que bellos, debe ser un honor llevarlos.